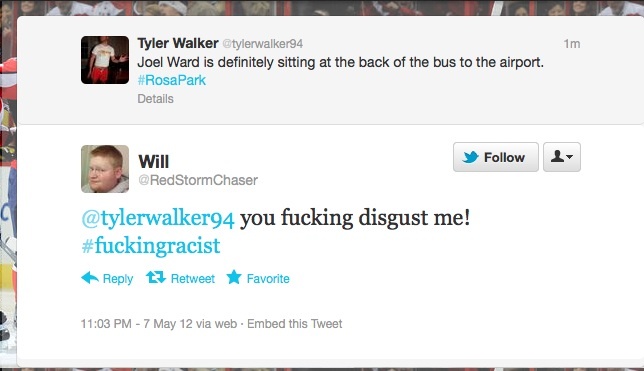 Sadly, this was one of the less-offensive of the many derogatory tweets about Joel Ward this evening. Less than two weeks ago, after Joel Ward scored in overtime of Game 7 to lead the Washington Capitals past the Boston Bruins, some hockey fans (many of whom identified as Bruins fans) took to Twitter to hurl racist abuse at the black Canadian forward from Toronto. While many fans of the Bruins and hockey more generally objected vociferously, clearly a significant amount of fans felt completely comfortable deploying racist epitaphs to insult the hockey player. Tonight, Ward took a devastating penalty for the Capitals when, with just over 20 seconds remaining and the Capitals nursing a 2-1 lead, he high-sticked the New York Rangers’ Carl Hagelin and drew blood. The Rangers scored before the buzzer to send the game to overtime and then, with Ward still serving the second half of his double-minor, won the game on a goal by defenseman Marc Staal. And then the Twitter racists returned in full force. A few weeks ago I submitted a revised version of a paper to an academic journal that examined the ways in which hockey fans used Twitter to react to and resist the dominant messaging presented in a hockey media broadcast. The paper is quite optimistic about the possibilities of new media as an avenue for the promotion of alternative understandings to dominant media representations of social and political issues. While I maintain this belief, I feel it is also important to recognize the ways in which new media, such as Twitter, can be used in conservative and anti-progressive manners. Tonight, sadly, offered such an occasion. Usually on this blog I try to be analytical and thoughtful about the topics under discussion. This post is very reactionary, with the data I present collected less than two hours ago. The point is merely to explore and highlight the range of racist statements that, for whatever reasons, some people feel compelled to post on Twitter. I will save the analysis for another day – instead, I presently offer a raw and not very well thought-out examination of some of the more egregious statements about Ward from Twitter users. Unfortunately the n-word made at least a few appearances this evening. By the time I collected these tweets, @C-Flight14 had thankfully been suspended from Twitter. However, his racist tweet lives on in the re-tweets and reactions of other users. @JackScholl did some unconvincing backpedaling. Because jokes about lynching black people are apparently acceptable if you recognize that they are overly harsh within 30 minutes of making them. @JaredGaspar sparked a firestorm when he tweeted his plantation comment. After a huge amount of backlash, he deleted the offending comment. The tweet, of course, had already gained infamy and was reproduced countless times over in retweets and responses, such as those by @tbridge. … the backlash became more severe. Of course, justifying an action by saying that worse things have been done by others is not exactly an airtight defense. @JaredGaspar tweeted many more provocative statements and weak excuses in defense of his initial tweet in the space of less than an hour. Needless to say, tonight he quickly and unexpectedly became a Twitter sensation because of his racist comments. Unfortunately other Twitter users felt the need to pull out the n-word to insult Ward. The audacity of the racist vitriol is as astounding as it is depressing. Thankfully many Twitter users fought back against racist Twitter users, and from what I observed there was a significant collective backlash from many hockey fans against the minority of racist fans. This suggests that new media such as Twitter may be somewhat self-regulated by users, with the majority – in this case, anti-racists – shouting down the minority. While this may seem promising, what happens if the majority support the reactionary, fear-based, and/or anti-progressive position? Hard to understand how people find that so easy to tweet. I mean, do you really want your name and picture next to that? Hockey’s whiteness is good to point out, but I also wonder if it’s hockey’s northern suburban-ness, where, from my experience, racism is mostly there for casual joking (and whatever that reveals). From Bill Simmons, on the last go round of the Ward bashing. He’s probably got a point. I don’t even blink when I see that stuff anymore. It’s just part of life on the Internet. If you don’t believe me, spend an hour reading YouTube comments some time. Just because last night became Boston’s spin on the Hateful Idiot Internet Wheel doesn’t mean some larger connection needs to be made, even if it may have fit neatly into a once-popular (and increasingly unfair) stereotype of Boston that stopped being true long ago. It’s not 1974 any more. Those assholes didn’t represent Boston, but rather the underbelly of the Internet itself. There’s a difference. Yeah I think that’s a good point about the casual joking, and I’m not totally sure what to make of that. There can certainly be humour in difference between people, with a humorous recognition of differences facilitating a deeper interpersonal connection. But humour can also be a convenient veil for what would otherwise be widely condemned as blatantly racist. And that can be a tricky intent to disentangle. As for the Simmons quotation, he is definitely on to something about such comments just being a normal part of life on the internet. That in and of itself is a fascination sociological question in my mind, and one that links up relatively focused (hockey) incidents such as this with much larger social phenomena. Where I think Simmons fails is by reacting personally to the negative reaction to Round 1 of the racist tweets toward Ward. The point should not be that BOSTON fans made these statements, but that HOCKEY fans made them. Simmons gets his guard up (much like many non-rioting Canucks fans did last June) because his fan culture and city were being tarred with the same brush based on the actions of a minority amongst them. I understand this defensive reaction as a fan, but it is a poor reason to outright dismiss the fact that some people actually did spew racial hatred through Twitter, at least some of whom were “real” Bruins fans. Dismissing the outrage toward this racism because it seems targeted at Bostonians simply, in my opinion, deflects attention away from grappling with the more complex and upsetting questions that emerge out of such incidents. Sounds like a cool organization and tournament! Is that something you’ve been involved with before, Ted? I learned to skate there, played there until I was 18 and even coached for a fall. It is a great place, and I should write something about it soon. Very cool. And yes, you should definitely write something about it! I suspected it was the same organization you were part of as soon as I saw the website. Agreed, that is definitely an interesting/important point. In Canada hockey is becoming increasingly suburbanized (though the small town is still a very critical part of Canadian hockey culture). In the US, when I think of hockey, I think mainly of rich, white suburbs. I have no idea if that is a fair association or if there is any research on the topic, but it’s the spatial demographics I associate with American, and increasingly Canadian, grassroots hockey. And Matt, I also had the same thought about “hipster racism” when I read Ted’s comments. It also got me thinking about discussions that, since Trayvon Martin was killed, have been prominently held about the fallacy of a “post-racial” society. I feel like there is a connection there, and that perhaps incidents such as these may fall at their nexus. “Hipster Racism” sounds like it could be made into an incredible Portlandia skit. It’s probably also close to what I had in mind: not a racism of direct conflict, but of distance and disinterest, which I suppose has all kinds of indirect causes and ramifications. It’s probably a similar phenomenon that’s happening with feminism: it’s no longer something so obvious that people are marching in the streets all the time, but that doesn’t mean we’re past it. I’m thinking of all the negative “jokes” about Hillary Clinton in 2008. If you don’t ever see a lot of black people, and you don’t get the sense that your privilege is based on their oppression, or anything like that (false or otherwise), maybe they become a kind of casual “other,” to whom the serious injustices of the past no longer apply (assuming, wrongly, that they are in the past)? Is that how the thinking would go: it’s jokable territory now?